Gigantic avalanche for 2000m in altitude on Bezengi Wall, Caucasus, Russia. 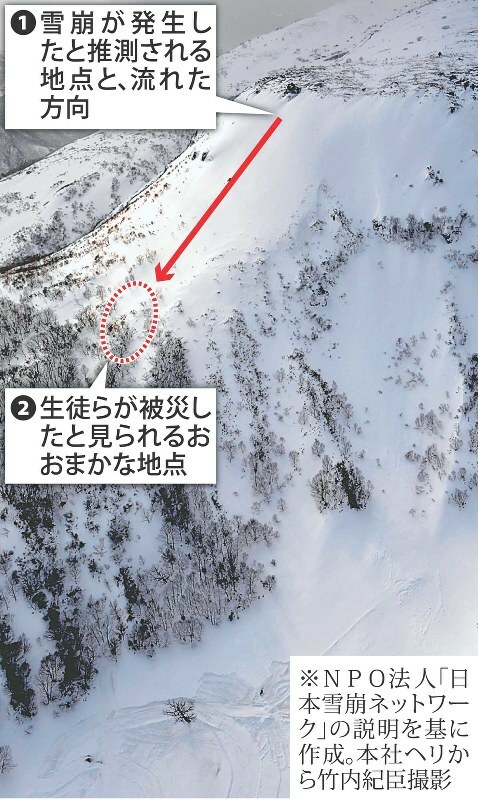 On 27 March 2017, a group of high-school students in Japan lead by teachers encountered an avalanche near the Nasu ski-resort, and 8 people (7 students and 1 teacher) died, and 40 were injured. Here I discuss what happened and how from a viewpoint of the winter mountain activity. The deadly accident happened during the 3-days Spring-mountain safety course for students of mountain-walking clubs in 8 high schools in Tochigi prefecture, run by the prefectural high-school PE council. Reportedly, the council had notified the clubs that any one who considered to participate the major (mountain-walking) competition in May must attend the course. Eleven high-school teachers in the prefecture took a lead and instruction role for the event, and reportedly some were highly experienced. 51 students attended the course. On 27th March, the final day of the event, 8 teachers and 40 students attended. The original plan on the day was to summit Mt Nasu (Mt Chausu). However, because of the foul weather, the teachers on site decided to change the plan to snow-wading walking practice on a slope near Nasu-Onsen Family Ski Resort in Yumoto, Nasu. They started the training at around 8 am. Allegedly it was in the blizzard and the visibility was poor at that time. The site of the training was a 30+ degrees slope above the piste of the ski resort. According to a civil servant of the town council, Avalanches have been of regular occurrence every year at the slopes above the piste. The ski resort had been already closed by that day after the winter season, and was not operating (lifts etc). Note: Japanese mountains are so snowy, it is an important skill to progress efficiently in deep powder snow, called "Russell", named after the snow-plough Russel Plow invented by the American James Russell. At around half eight am, an avalanche happened [two avalanches as reported later] and almost all the group members were involved. It is thought to be a surface avalanche (as opposed to a full-depth one). The rescue team arrived at the site 3.5 hours after the avalanche. They found some victims to be buried, and although one was miraculously rescued alive, 8 people were dead (all the fatality was due to suffocation by the pressure of burial in snow). Reportedly, the deepest depth of buried victims was 2 metres. Note the initial call for rescue to the police was made by a teacher of the group, who descended to a hotel at the foot of a mountain, where he phoned, and it was about an hour after the avalanche. Allegedly there was a separate ground-team at the foot of a mountain, and the ground team and group on site had a radio link. The reason why the radio link was not used, and it took as long as 1 hour before the initial contact to call for a rescue is not yet understood well at the time of writing. At around half 10 am the previous day, the local Utsunomiya meteorology office had issued warnings for heavy snowfall, avalanches, and snow-whirl. It forecast the 24-hr accumulated snowfall by the morning of 27th in the mountains in the northern part of the prefecture to be 30 cm, and issued the warning. According to the national meteorology office, the local observation point in Nasu Town saw 0 cm of snowfall accumulation at 1 am on 27th, and 33cm by 9 am on 27th. None of the group members was reported to be equipped with avalanche transceivers. All the members were brought back down (live or dead) from the site by the rescue team that hurried to the site. Avalanches are categorised into many classes, and each of them has a different mechanisms and conditions to be triggered. Here I consider about the dry loose-snow surface avalanches by fresh snow, which was the one that supposedly happened on the day. The mechanism and conditions of triggering of surface avalanches are complex. They depend on the complex combination of history of snowfall, wind (strength and direction), temperature, sunlight, as well as the local geography However, there are some typical textbook conditions that induce such avalanches. Here is the list. Fresh-snow surface avalanches are usually driven by dry fresh snow. Generally speaking, more fresh snow is accumulated, more likely an avalanche occurs, and larger the scale of an avalanche would be if one occurs. (Note that other types of avalanches, such as full-depth avalanches, can occur even when the above-mentioned conditions are not met, and the damage of them, if one occurs, may often well surpass that of a fresh-snow surface avalanche. But is is beyond the scope of this article.) During an on-going snowfall, the amount of accumulated snow is increasing, as time passes, and so is the risk of avalanches. 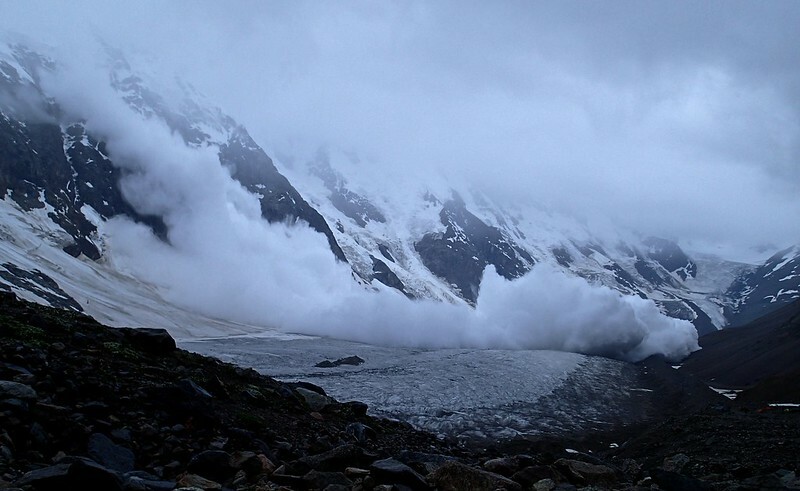 The avalanche is a phenomenon of cascade slide of snow that sits on top of a weak layer. The mechanism of formation of a weak layer varies and is complex. A typical and frequent example especially in the spring time is the iced-up snow surface being a weak layer. For example, when the surface of snow melts during the day under sunlight and refreezes during night with the dropped temperature, the snow surface forms a weak layer. If fresh snow is accumulated on it, it is like snow on top of an ice rink. That means the conditions for an avalanche to be triggered are set up with the fresh snow ready to slide. Avalanches would never happen on a flat field up to the horizon, of course. It is known that slab avalanches are most likely to happen on slopes with the gradient of 30°-45°. Snow is less likely to slide on less steep terrains, whereas snow is not very likely to be accumulated enough to trigger an avalanche on steeper terrains, because snow tends to slide as soon as it lands. Even when a point (you stand on) is on a flat terrain, if there is a steep terrain next to it, avalanches that are triggered on the steep terrain may reach the point. A common threshold of the elevation for safety is 18 degrees (referred to as Takahashi's 18-degree law in Japan; c.f., tan 18° ≒ 1/3). I should note references (Tony Daffern 1992, Ferguson & LaChapelle 2003) point out avalanches can happen on the slope with the gradient as small as 15 degrees. Following that, the strictly safe threshold should be even smaller (than 18 degrees). In short, out of woods is more vulnerable. When there are a lot of trees, the slope is less likely to avalanche. Also, the fact that there are many trees indicates that no major avalanches which would fall down the trees have not ocurred for a long time. Avalanches can happen on any slopes. In particular, concave-shaped places like a valley are more likely to host avalanches because more snow is accumulated. Furthermore, once an avalanche occurs somewhere, it will follow the gravity like a river, and hence concave topography is more likely to be the passage of the avalanche. In ski resorts, they press the snow on piste with pisting machines, which eliminate any weak layers in the snow and creates the conditions in which avalanches are unlikely to happen. For that reason, avalanches are (of course) least likely to happen on pistes of working ski resorts. Similarly, more people walk on a particular place of a snow field, more snow is pressed, and less likely an avalanche would happen (n.b., that does not guarantee avalanches would never happen; a record tells in a military march the 30th or so person has once triggered an avalanche). On the other hand, off-piste terrains close to a ski resort is perhaps the most risky places for avalanches. The fact that there is a ski resort indicates the place is very snowy and likely hosts open slopes, which offer an ideal condition for avalanches to happen. It is not unusual avalanches naturally happen after a certain amount of snowfall, which exceeds a certain threshold. Equally, avalanches can be triggered by a rock fall, strong gust, or even an earthquake [which may not be very rare in Japan]. In many ski resorts in the Alps, they control the risk of avalanches by inducing ones artificially after heavy snowfall (in fact, a media report says the Nasu ski resort too control the risk with explosives during the season. The ski resort was closed by the day of the accident, and so no measures of controlling the risk were taken at that time). Many of reported accidents of avalanches were triggered by humans (that does not mean avalanches would not happen without humans, but it is probably the biased observations due to the fact an avalanche that caused an accident means by definition there was a person(s)). Generally speaking, more powerful the trigger is, more likely an avalanche happens. For example, in the two cases of 1 or 10 people entering the same slope, an avalanche is more likely to be triggered in the latter case. Here is the list of the most fundamental points for them. In reality, there are far more and finer points. It is all down to how to minimise the risk. Do your homework well and thoroughly and do not enter a high-risk slope. Full stop. Still, you can never reduce the risk to null, and so you must weigh the risk and act accordingly. It is a bit like the risk of traffic accidents; clearly the safest way to avoid a traffic accident is just to stay in and never get out on a road, but nevertheless people do get out. Before entering a snow slope, assess the risk of avalanches on the slope, performing, for example, a sheer test (it goes without saying it is essential to be knowledgeable and competent enough to assess the risk). In the real world, the risk of avalanches varies from slop to slope, and therefore experienced skiers and mountaineers assess the risk, often performing a sheer test, every time they enter a different slope. Be very cautious of which line you take. In short, choose the terrain with trees rather than an open slope, and a ridge line rather than a concave topography (even if the difference is mere 2 metres), avoid 30°-45° slopes and take a less steep (or steeper) slope, and progress without passing a risky slope, even if it would mean much more distant than the straight line if necessary. If your group nonetheless enters a relatively high-risk slope, pass it for one person at a time, and as swiftly as possible. Longer you spend on a risky terrain, higher the risk is. More people are on the same slope, more likely they trigger an avalanche. Also, when unfortunately an avalanche ever happens and sweeps some one, if there are survivors, they can immediately take an action to rescue the victim. Conversely, if all of the party members are swept away, that is it. A snow shovel is indispensable to perform a sheer test. It is also essential to dig out a buried victim as swiftly as possible, after an avalanche. Once a person has been buried in snow, the chance of survival is known to drop dramatically after the initial 15 minutes. Any later than that, the chance of death due to suffocating and/or freezing increases rapidly. For that reason, calling for a mountain rescue is not much use apart from searching for the remain. If there is a chance to save the lives of buried victims after an avalanche, it is only when the survivors on site take an immediate action to rescue them. It would be nearly impossible to find a buried victim without using (working) avalanche transceivers. Conversely, if you all are equipped with modern avalanche transceivers, you can swiftly identify the point where a victim(s) is completely buried, and so there is a much higher chance the victim would be recovered while still alive. Note that although the modern avalanche transceivers are sophisticatedly designed to be foolproof, prior practices are still essential. In addition to these three kinds of gear, use of ABS (airbag) rucksacks is becoming increasingly common nowadays. It is the only gear that enables more or less self-rescue when one is swept by an avalanche, and dramatically increases the chance of survival. It is thus becoming a modern standard equipment for off-piste skiers. However, I have hardly heard of mountaineers using one, perhaps because they usually carry a heavy sack on their back. On-site judgement is always very important in assessing the risk of avalanches. Even when other places are safe, a slope in front can be risky, or conversely, even when the forecast says a high-risk avalanche day, the slope in front can be safe enough. For that reason, we should be very careful to say something about other people's action, generally speaking. Bearing it in mind, here is my conservative argument. These alone are not a definite proof of a high risk of avalanches One should be alerted, but not much more than that. As a rule of thumb, it is an ideal condition for a surface avalanche to happen. Given the spring season, a weak layer on the snow surface is suspected to have been formed by the previous night, and then a massive amount of fresh snow was accumulated on top of it. The most vulnerable slope angle to avalanches. One of the favourable conditions for avalanches to occur. The fact there are no trees indicates the slope is likely to have seen avalanches repeatedly in the past. Once an avalanche happens, there is nowhere to escape, too. The fact it was close to a ski resort suggests there are open slopes with deep snow. Since it has been closed, no one or expert is assessing or controlling the avalanche conditions. The ease of access by car up to a high altitude in a way makes it one of the most risky places for avalanches. Judging from the photo (from aircraft, figure on the right) and article by the newspaper Mainichi Shimbun, the group seemed to be in a concave topography. It would be a natural avalanche passage. Reportedly, a few groups were taking a rest at the time when the avalanche occurred. No one died in the groups that were taking a rest, but it seems many of them got injured, judging from the number of casualties. A golden principle in avalanche-prone terrains is to pass the risky place as swiftly as possible and rest at a safe place. The fact none of them who were taking a rest died may mean that it was a right place to take a rest at, or the fact many got injured may mean their choice of the place to rest wasn't good. Reportedly, none of the group members was equipped with an avalanche transceiver. Judging from the fact all of the victims who were killed were due to suffocation, if all the members had been equipped with avalanche transceivers and other necessary equipment and been skilled to use them appropriately, the number of casualties might have been reduced, or potentially all of them might have been saved if lucky (However, I should note that reportedly, parts of the body of some of the buried victims were sticking out of snow when the rescue team arrived, and thus chances are the complete burial might not have been the reason the search and self-rescue had failed). Anyhow, generally speaking, if one is buried completely after an avalanche when they don't have working avalanche transceivers with them, there would be no hope for survival. In general, the place for deep-snow wading training is (unless it is an extremely flat field) a good candidate to host avalanches. In this case, the group was heading for a risky 30+ degrees slope, and so it is safe to say they were under-equipped. Reportedly they had planned to summit a mountain (via a normal route? ), but suddenly changed the plan during the course to snow-wading training. In general, the suitable equipment for walking via a normal route to a (snowy) spring mountain and snow-wading is different. If one is prepared for the latter, it is not a big deal to adjust the gear into the former, whereas the other way around is not straightforward. In particular, I am afraid it is perhaps unlikely that high-school students (who are not much experienced and possibly not very well equipped) were well equipped for deep snow-wading (which wasn't a part of the initial plan) from the beginning. Of course, my conjecture can well be wrong and they may have been well equipped, and if so, I have nothing to comment. [Added note] It was reported one of the students were wearing clothes which his father had used in his youth. In all fairness (though I do understand the feeling of attachment in the family), the technical standard of clothes for winter outdoor differs a lot between now and 20-30 years ago; it is much more advanced now than then. Also, clothes degrade with time. Though the degree varies a lot, depending on the ingredients, a 5-years-old hard shell is noticeably different from the brand new condition even it has not been in use. For that reason, use of the latest (or close) model of clothes is highly recommended when it comes to the high-tech clothes like those for winter mountains, which should cope with the harshest weather. In this case it is suspected the students had not been well instructed for what sort of clothes to wear. I am afraid it is unlikely that all the students were well equipped for deep-snow wading work. When the rescue team rushed to the site 3.5 hours after the avalanche, reportedly a few victims were buried with a part of their body sticking out of the snow surface (one of them was miraculously rescued alive), while the survived were shivering somewhere close. Many of them were reported to be only lightly injured, and so must be capable of performing a rescuing action. Perhaps they were panicked so much they could not do anything. I conjecture they may have not had a snow shovel, which is one of the essential equipment in snowy mountains. With a shovel, it would be a very easy task to dig out a victim half buried in snow. Then, no matter how badly they are panicked, I can imagine if they hear a call for a help or see a body which sticks out of snow moving, they will react. Conversely, without a shovel, it would be a somewhat troublesome job to dig a hardened snow after an avalanche. Nevertheless, to be fair, people in the normal mind state would be able to dig out eventually, using an axe (which they must had) or even just hands and feet (especially boots), even if it takes some time. It would never take 3.5 hours. The fact the survivors failed to take an action to save their friends' lives would be, I fear, a serious lasting trauma for them in their lives from now…. Arguably, shovels may not be essential gear in walking up to snowy mountain via a safe enough route on a ridge (which was perhaps their original plan), though I know many would argue to carry one always no matter what. In contrast, in deep snow where one needs wading through, there is no room for argument; you need a shovel. The fact a shovel was (most likely) not set as a mandatory equipment for the group members in this event (or possibly worse and beyond one's imagination, none of them had a shovel) was the fundamental flaw in their planning, together with lack of avalanche transceivers. It is a commonsense and standard practice among winter-mountain goers to perform a sheer test of snow to assess the risk of avalanches before entering a snow slope which has a certain risk of avalanches. In particular, during the educational course for winter mountains like this, even when the leader(s) judges the avalanche risk of the slope to be the minimum, the instructors should instruct each group to perform a sheer test, because every student should learn sheer tests as a habit every time before they enter a snowy slope, and also because it is important to learn what the result of a sheer test on ordinary (safe) slopes is like so that they can tell when they in future encounter more extraordinary (dangerous) slopes (In fact, as an added bonus, sheer tests of snow are actually one of more fun stuffs to do in training for snowy mountains, and so students would have been more than happy to participate it). Or, at the very least, the leader should perform and demonstrate a sheer test in front of every one. However, I have heard no report of such a precaution from this group. I strongly suspect none of them performed a sheer test on the day. Indeed, if the sheer test had been performed, I suspect the high risk of avalanches would have been rather apparent, given the observed weather history and the very fact the avalanche did occur. This suspicion is related to my another conjecture they probably didn't have a shovel as mentioned above — to perform a sheer test without a shovel would be laborious and takes time, and so people without a shovel tend not to bother. One of the primary reasons a shovel is essential equipment in snowy mountains is it is indispensable to perform sheer tests, perhaps repeatedly in a day. Reportedly, some of the leaders in the group were very experienced. It sounds like they had enough experience to lead and teach students in snowy mountains. In mountain accidents, it is usually hard to make a guess work without seeing or knowing the detailed situation on the spot, because it is not uncommon in mountains that to do something that appears against the textbook is actually the best action in the given situation. Thus, I am in general reluctant to give a comment as a bystander. Another point about the leaders is the action immediately after the avalanche. The ideal leaders should have calmly composed themselves and the whole group to perform an immediate and full-throttle rescue action of the victims, especially the apparently most serious ones, that is, those buried in snow. Had the leaders been competent, the half-buried victims would not have been left unrescued. Possibly some leaders got seriously injured, but it is apparent from the media report there were leaders who were unhurt or only slightly hurt. There were plenty of survivors many of whom were either unhurt or slightly hurt, who would have been willing to cooperate in the rescue actions, had they been instructed. I stress my point is not to condemn the leaders. I sincerely feel sorry for the trauma the surviving leaders, who are not a professional mountaineer or mountain guide but a mere school teacher, will sustain for the rest of their lives. Rather, what I am pointing out here is the lack of their skill as a mountain leader as a matter of fact. The fundamental problem lies on the system and process those people who lack of the required skill were selected to take the leadership of the course. However, it is well beyond the scope of this article. In this article I have discussed, based on the facts revealed by the time of this writing and from the technical viewpoint of activity on snowy mountains, the judgement and action of the group only.